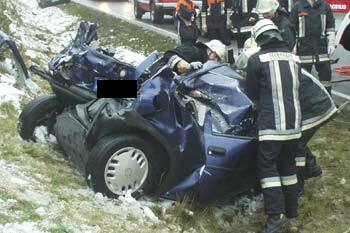 On 11/22/2004 at 10.57 a m the VFDs Nittenau, Bergham, Hauzenstein and Pettenreuth were called for an mva on highway B16. 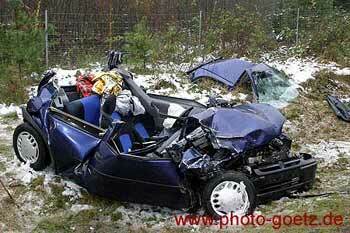 Dispatch said "mva with one person trapped". The VFD Nittenau First Responder had been alarmed one minute before together with a paramedics team by EMS dispatch. 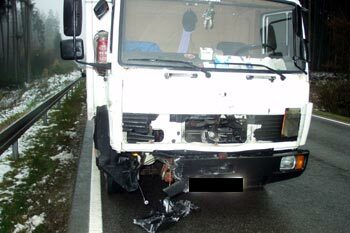 A compact car non-braked had crashed against a truck carrying wood and thus got on the left lane. There it crashed against an oncoming truck and was catapulted into the ditch. 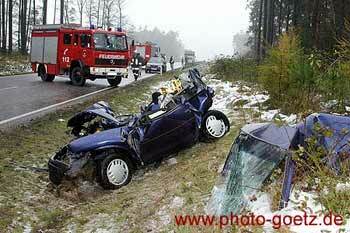 The car driver was trapped inside her car. 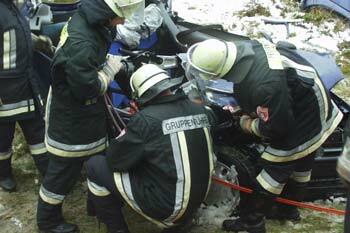 The VFDs Nittenau and Bergham tried to extricate the woman from two sides of the car and removed doors and roof. After a short time the severely injured woman was free. A rescue helicopter could not approach because of bad weather, so the person was transported to the hospital by ambulance. Traffic had to be controlled for about one and a half hours. The amount of loss was about 50000 Euros.